Bristol Motor Speedway has been the site of a number of wonderful races; and now it will be the site of a football game expected to smash college football attendance records (due to the vast seating of Bristol). Tennessee is eager to prove they are still the SEC East favorite after surviving a scare against Sun Belt power Appalachian State and subsequently watching fellow division foe Georgia beat ranked North Carolina. The key for the Volunteers will be figuring out a passing game that looked completely out of sync in the opener. Jalen Hurd and Alvin Kamara should be able to carry the load on the ground, but the Vols won't move the ball against a well-coached Hokies' defense unless quarterback Joshua Dobbs can move the ball through the air. He will also need help from an offensive line that struggled against the Mountaineers, especially considering VT defensive coordinator Bud Foster loves to dial up exotic blitzes. It is hard to know what we are getting from Virginia Tech's offense this season. The unit had struggled quite a bit under former head coach Frank Beamer the past couple years, but looked solid in the opener, although that was against FCS opponent Liberty. Quarterback Jerod Evans is a dual threat that can open up things for the Hokies offensively, but Tennessee should counter with end Derek Barnett and a fabulous front seven. The Hokies will also hope to find their rushing attack, after it struggled a year ago. 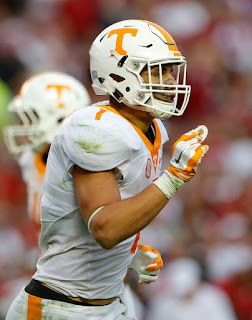 Top to bottom, Tennessee is the more talented team, but that doesn't always mean they will get the job done, as last week proved. While that may be true, I feel more confident that their offense will outscore VT then the other way around. In the latest edition of the "Holy War" rivalry, both BYU and Utah will hope to increase their records to 2-0. The Cougars opened up their season with a strong showing against a decent Power-Five team, escaping with a victory over Arizona, while Utah beat up on in-state foe Southern Utah. BYU will bring an impressive rushing attack to the equation, led by dual threat quarterback Taysom Hill and long-time running back Jamaal Williams. They'll face an interesting battle against the Utes' defense, which is head by a strong front seven and has dynamic defensive back Marcus Williams in back. That should keep Utah in the game no matter what, but their offense has to prove they can move the ball. Injuries had a major impact on the team in the second half, but the offense still disappeared late in 2015 and didn't look necessarily great in the opener. Quarterback Troy Williams has shown he can move the ball on a consistent basis, and can also make plays with his legs. He will have to prove himself against a Cougars' defense that isn't as well-coached or as disciplined as the Utes' unit, but can still make plenty of plays. Utah is also hoping to rejuvenate their rushing attack, as the group struggled in their first game, and may miss the departed Devontae Booker quite a bit. This is really going to be an interesting new edition of this classic rivalry. Neither team is ranked, but both have plenty of talent and experience up and down their roster, and looked great in the opener. BYU has more explosiveness and I think Hill can move the ball even against the Utes' great D. They also have luck and magic on their side with some of the September victories they have achieved over the past couple seasons, and could use it to win a close one. After a relatively underwhelming opening showing, TCU is eager to prove that they are still a Big 12 favorite, much like Tennessee is trying to do against Virginia Tech. The Horned Frogs ended up with a victory in Week One, but were tied with South Dakota State at halftime. Even though it was closer than they may have hoped, their offense still definitely showed it could move the ball. Former Texas A&M transfer Kenny Hill threw for 439 yards in the opener, and seems to be a good fit in the Horned Frogs' explosive offense. He'll be joined by Taj Williams and KaVontae Turpin at receiver, which give the Frogs plenty of perimeter threats. TCU won't get an easy battle with Arkansas, who is also trying to prove something. Not only did they barely survive Louisiana Tech in their opener, Arkansas also is trying to help restore the SEC West's reputation after it had a rough first week (LSU lost, Mississippi State was beat by South Alabama, Ole Miss lost). The Razorbacks are hoping for more consistency from first-year starting QB Austin Allen, who had two interceptions against La. Tech. It won't be easy against a TCU team that has great defensive ends James McFarland and Josh Carraway along with ball-hawking cornerback Ranthony Texada. Arkansas will lean on their typical power rushing attack, behind a big, bulky offensive line. Teams with that power rushing game have typically been able to out-perform spread offenses, because they control the ball and play smart. That could be the case in this one, especially if they can force Hill to turn the ball over. However, I still like TCU a little bit more in this game. They can keep Arkansas off balance with their vast abundance of playmakers and speed, and their defense should be much improved this season, even though it wasn't great in the opener. They should be able to win in a close one, particularly considering they get the tough Razorbacks at home.